Take a look at this announcement and move quickly if you one to be one of the four. 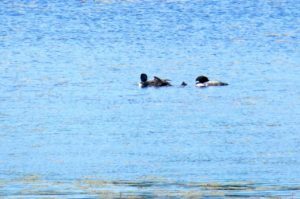 Your efforts can help improve the quality of Province Lake. 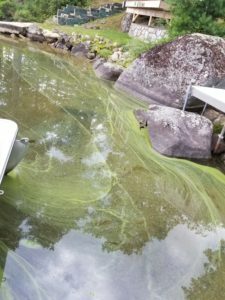 Sadly we are once again starting to experience cyanobacteria blooms on the lake. The photo below is from this morning on Point Road. We also had a bloom a few weeks ago that was more widely spread. Should you see anything like this, you should avoid going in it and especially keep your young kids and pets out of it. As a reminder, cyanobacteria is in every fresh water body in the world. Blooms however happen depending on a multiple of conditions such as temperature, phosphorus levels, rain fall, etc. etc. etc.. The blooms can come quick and then disappear quickly or they can stay around for a while. As stated above .. just avoid them. Please make sure you review them before next years meeting as the minutes will be voted on for acceptance. 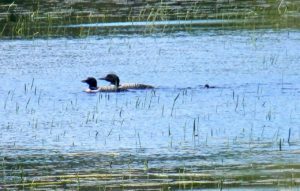 On Saturday, July 1, a single loon chic was hatched to the adult pair that nested on Province Lake during June. 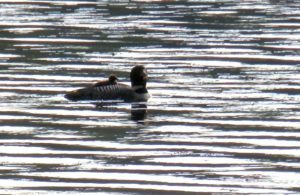 The chic has been growing under the watchful eyes and constant companionship of the adults. 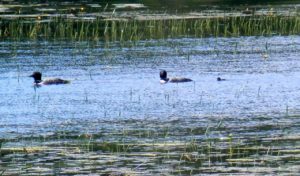 On Thursday evening, July 20, the State certified biologist team from the Loon Preservation Center in Moultonborough will be on our lake to band the adult(s). You may see a boat with a bright light on it between 8:30 and 10pm. 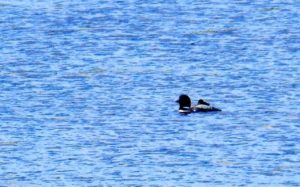 The LPC has been banding loons for decades and the team has extensive experience in the process. They assure us that the procedure is safe and will involve as little stress as possible. Please do not attempt to join the activity. STOLEN BOAT MOTOR, BE VIGILANT! Sadly, someone stole a 9 hp boat motor and fuel tank from a boat parked at the beach along Rte 153 near Butler Field. They were locked to the boat and the locks were cut. A police report was filed. We thought you should be aware and you should watch your boats etc. and keep an eye out for suspicious activity. Hope to see your there. We are looking for citizen scientists and outdoor enthusiasts to join us at Province Lake Golf Course on Saturday, June 3 (rain date June 4) for an exciting project discovering and mapping the plant and animal species around the course. Experts will be on hand to help us identify what we see. Registration is now open for the morning and afternoon sessions – please sign up here. Your help will directly benefit Province Lake Golf Course’s stewardship of their natural resources and help with environmentally friendly golf course maintenance strategies. 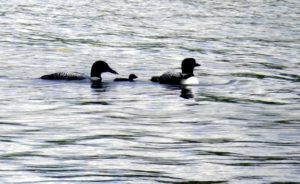 As a neighbor to Province Lake, the PLGC is seeking certification as an Audubon International Cooperative Sanctuary to preserve habitats and protect water quality. 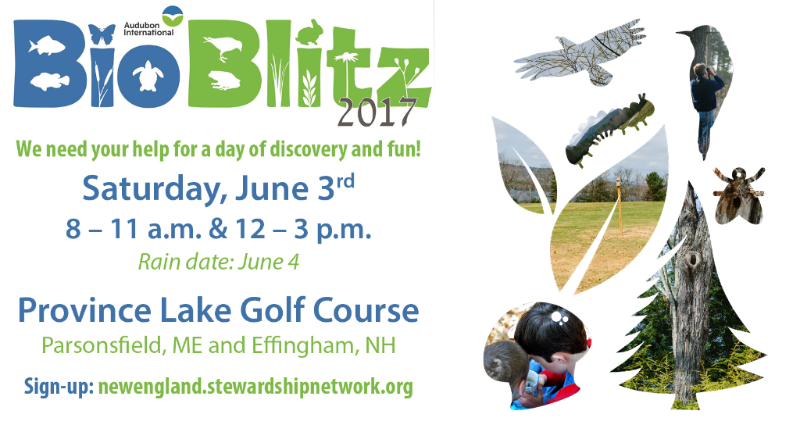 This event is co-sponsored by the Province Lake Golf Course, Province Lake Association, Acton Wakefield Watersheds Alliance (AWWA), UNH Cooperative Extension, and the Stewardship Network: New England. The PLA Annual Meeting Minutes for the 2016 meeting and the Fall 2016 Newsletter have now been posted under the News tab from the home page of the website.